If you have noticed that things seem to be going wrong over the past few weeks that's because Mercury is Retrograde. That means it is going backwards. It started to do that April 17 and will continue until May 11. For some reason mechanical things tend to breakdown, go wrong, cause delays etc. So, if you notice these things in your life, just go easy and go with the flow. It will be over soon and life will return to normal. Welcome to our NUMBERS web site! Numerology has dated back centuries and been in practice ever since. Although there are plenty of books out there that just about any one interested in numerology could read. It is a rare case however when the information is passed down from master to master personally. Only the notes I took at the time of my tutoring are here in this dimension. My master tutor has now passed away and I carry on the tradition for her as she did previously. Some of the information you will receive will not be written in any book and could be just the piece of the puzzle you have been searching for. People have found that my readings are not like any traditional ones they have ever had before. This will not tell you what your lucky numbers or which month will be good for you. You will most likely receive deep unsual information that you can use to improve your life now and in the future. If you have ever wondered what life is all about you need to have a numerology chart drawn up in your name and birth date. That will give you clues as to what you things you might want to explore during your life. What you came here to accomplish this life time. Do you want to do something to make your life the best it can be? Having a reading done whether you are in person or far across the globe can improve your life by working with the information given to you. I will give you a blueprint of your life. The things you came here to learn, to improve and to avoid will be explained. You will see why you are struggling with certain things and why others are easy for you. Countless clients have told me their lives took a major turn for the better after listening to "Your Own Advice." That's right. This is not me giving you advice, this is "You giving You advice." The information I will give you are the things you intended on getting done this life time and perhaps forgot. Like most of us we can't and don't remember choices we made BEFORE we were born. I am just the messenger or telephone if you will and I am able to interpret your name and birth date you chose to express life this time around. The information you will receive will be with you for your whole life unless you marry or change your name in some way. Have you ever wondered "What is Your Destiny". Now you have a rare opportunity to have a reading done personally for you. This will not always be the case in the future, so now is the time to act. The earth is changing at a rapid pace and having as many tools to make the most of what you have is paramount. All that is needed is your full name at the time of birth and any additional names given you while growing up and your birth date. The time is not important to these charts. You will be given a recording of your reading if you are out of the area. It's as simple as that. Do it for yourself. Do it for your loved ones. You will only be grateful for it. Linda has just published her latest book, to take a look click on the links below. 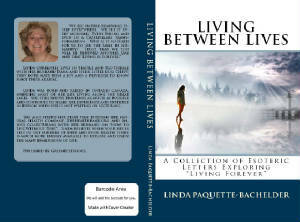 Read a Preview of Living Between Lives or to order a book through Amazon, click here. We accept checks, money orders and pay pal. Remember we always honor your privacy and will never sell or rent your information.